A couple of months ago, I began noticed something that B said "It is what it is" a lot. To be fair, she probably wasn’t saying it *that* much, but, after I noticed the phrase, my brain would note every instance of it. It wasn’t only B, though. I began to note other people saying it. 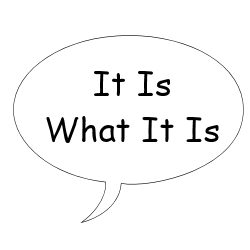 It seemed that everyone was saying "It is what it is" all the time. The more I noticed it, the more the saying annoyed me. I can’t explain why it annoys me, it just does. 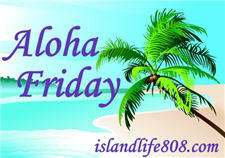 My Aloha Friday question for today is: What phrases annoy you? Pretty much anything that comes out of the mouths of a certain political party these days…. Annoying phrases hmmm I can’t think of one, but there are some very annoying curse words that men use that REALLY bugs me & shouldn’t be said in front of a lady. I think I am more annoyed by the phrases I use too much. I don’t like listening to other people curse though. Especially around my kids! I’m the realest person you’ll ever meet.